Here, nine of our favorite yogurt recipes to eat during Hay Fever season. Birds chirping and beautiful blooming flowers are sure signs that spring is in the air. Unfortunately for those suffering from itchy, watery eyes and bouts of sneezing, hay fever is also in the air. But there’s good news: A study conducted by doctors at the Vanderbilt University School of Medicine in Nashville has found that eating yogurt might ease your symptoms. It's just one study, but frankly we're on board with eating yogurt regardless of whether it cures our allergies. 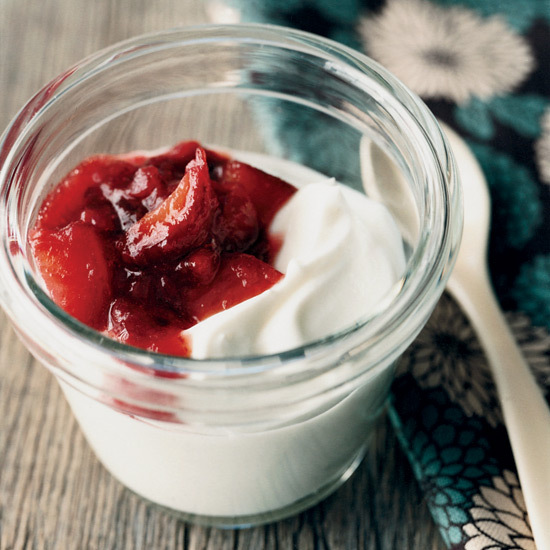 Here, nine of our favorite yogurt recipes. Filled with herbs, nuts and raisins, this soup is delicious with grilled bread. A lighter take on the classic Green Goddess dressing, this is delicious on salads or as a dip for crisp vegetables. A snap to assemble, this tangy and refreshing dip is a perfect accompaniment for grilled meats or steamed vegetables. Light, bright and refreshing, make this your go-to quinoa salad recipe for picnic gatherings. The clever use of tahini (sesame seed paste) here gives this herbed yogurt sauce an instant Middle Eastern flavor. This easy, fresh-tasting yogurt marinade helps the chicken stay juicy even if it's a little overcooked. The marinade also works well with skin-on boneless breasts or thighs. If your strawberries aren’t ripe enough, swap for another berry. Health bonus: The plums in this tangy-sweet compote are rich in vitamin C, and the milk and yogurt are great sources of calcium.